March 12, 2012 – Modern turbines have solid instead of latticed towers, so birds can’t rest or nest on them. They can, however, still perch on the nacelle (the bus-sized generator housing at the top of the tower). Is the lower rpm of modern wind turbines safer for birds and bats? Modern utility-scale wind turbines turn at a much lower rpm than older models. Because the blades are so long and are moving 150 to 200 mph at the tips, depending on the model, the impact on birds and bats remains substantial. What studies have been done on the impact of wind turbines on birds and bats? Few studies have been done to determine the true effect of industrial wind turbines on birds and bats, and fewer studies still that have been done independently of the wind companies’ control. The evidence is clear, though, that wind turbines present yet another threat to the lives of birds and bats. 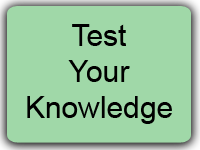 The risk appears to be much greater in some areas than in others. The first-year study of the “Maple Ridge” facility on the Tug Hill plateau of New York estimated that 2,000 to 4,000 birds and bats were killed by 120 turbines during the 5-month study period in 2006 (click here for the report; click here for May 1, 2007, testimony to the U.S. House Natural Resources subcommittee on Fisheries, Wildlife and Oceans). What does the US Fish & Wildlife Service think about wind power? The US Fish & Wildlife Service is concerned about the danger to birds. They have issued siting guidelines which recommend that wind turbines should not be installed near wetlands, on mountain ridges, near shorelines, or in other locations known as concentration areas for wildlife or at sites subject to frequent fog or low-lying clouds during spring and fall migrations. How do wind turbines affect birds? Mountain ridges and coastal areas, where industrial turbines are often installed, are features of the landscape that concentrate many birds. Songbirds mostly migrate at night and low enough to collide with the blades of large wind turbines. 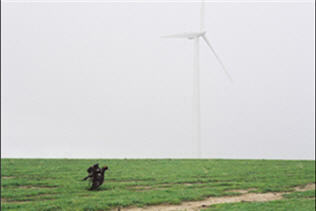 The presence of large wind turbines may cause birds to avoid the site, thus losing a foraging resource and requiring extra energy to fly around it. The cumulative effect of multiple facilities could have a serious toll on bird populations. The activities of prairie birds, including mating and nesting, are easily disturbed — even at a great distance — by the construction and continuing operation of an industrial wind power facility, which can spread over hundreds, often thousands, of acres. Are raptors threatened by industrial wind turbines? Wind power is a unique threat to raptors (hawks, eagles, falcons, owls, and vultures) — many of them already endangered — and other large birds, such as ducks, geese, swans, and cranes. The risk of collision not only threatens individual birds but also augments existing threats to their populations. The cumulative effect of multiple facilities may threaten the viable breeding of several species already in decline. Do wind turbines kill more birds and bats than other human activities? Promoters of industrial wind power often try to divert our attention to the carnage wrought by office tower windows, cars, and housecats, as if a greater wrong excuses the lesser. Even using the scant data inconsistently compiled by consultants hired by the wind power developers, it is clear that industrial wind turbines kill many more birds and bats per unit than these other causes, particularly raptors (such as eagles and hawks) and migrating bats and songbirds. Is the impact to birds and bats justified? Promoters of industrial wind power try to justify the threats to birds and bats with the claim that they are actually saving even more birds by cleaning the air and reversing global warming. They are wrong in that rationalization, because wind power does not replace other sources of electricity to such a meaningful degree (see the “Output” FAQ). Do wind turbines kill bats? The threat to bats has turned out to be a problem the industry can’t deny. FPL Energy ended access to its facilities after independent research documented that thousands of bats were killed in just a couple of months at one location and that this pattern of mortality was being seen at other sites as well. To divert attention from this outrage and their lack of action to remedy it, FPL Energy announced in January 2006 that it would fund some bat conservation projects. That effort will not, however, mitigate the harm they are causing, let alone justify or reduce it. A revealing story comes from Carleton College in Northfield, Minnesota, which constructed a 1.65-megawatt wind turbine in September 2004 out in the middle of a corn field two miles from campus. In October 2005, the Winona Daily News described a tour led by project director Rob Lampa. Lampa told the group that they had seen no sign of a single bird or bat death since the turbine was switched on. But as they were leaving, one of the group from Winona pointed out something on the ground to one of the county commissioners with her. It was a dead bat. Nearby was another. As one of NWW’s correspondents commented, Lampa will have to make sure the clean-up crew does a better job before the next tour! Do wind turbines affect other animals besides birds and bats? 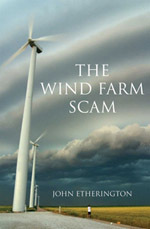 As with birds and bats, there are no reliable studies of the effect of industrial wind turbine facilities on other animals. The installation of such large structures in wild areas, along with supporting roads and transmission infrastructure and the clearing of trees on mountain ridges, inevitably has a negative effect, if only because of the loss, degradation, and fragmentation of habitat, especially ecologically vital interior forest. The turbines also move (producing noise and vibration) and are lit by strobes day and night, adding to the distressing impact they likely have. Mr. Duchamp claims he found two errors amounting to that much distortion in a report assessing the risk posed by 7 wind farms to the survival of the Tasmanian Wedge-tailed Eagle. “As a result, the risk was misrepresented and the species is now condemned to rapid extinction”. He pinpoints the errors in an open letter reproduced below. STEI holds the authors of the report, Biosis Research Pty. Ltd., responsible for this biodiversity disaster. “All over the world, conservationists were disturbed to learn that rare TWT eagles are being killed in significant numbers at the Woolnorth wind farm” says Duchamp, who can’t understand why these consultants are still in business. “They are now assessing a highly sensitive windfarm project in Victoria, but are using the same erroneous parameters that failed in Tasmania. They claim to have corrected them, but this is not true. They even added more distortion.” This manipulation, says STEI, allows them to predict insignificant mortality where in fact 200 to 300 eagles will die. 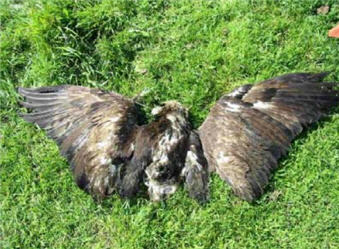 Wedge-tailed Eagle crippled by a wind turbine at Starfish Hill wind farm, South Australia. Turbine blades travel at speeds up to 300 kph at the tip, but appear to move leisurely. This fools the birds. Australians may have been misled about other species as well, warns Duchamp. On numerous occasions the services of BIOSIS have been used, and negligible mortality has been predicted. He has in mind the cases of the White-bellied Sea Eagle, the Orange-bellied Parrot, the Swift Parrot, and the Brolga, some of them listed as endangered. Save the Eagles International is a platform constituted by ornithologists and nature conservationists advocating for a realistic assessment of the bird/windfarm problem. Please scroll down to view their open letter exposing the catastrophic error, the misrepresentations and the manipulations. Golden Eagle mangled to death by a wind turbine blade at Altamont Pass, California.This huge wind farm holds a record: it is estimated to have killed 2,300 golden eagles in 20 years (Dr. Smallwood et al. 2004).